What does it take to play baseball for the United States Air Force Academy? According to Coach Mike Kazlausky (Coach Kaz), it takes much more than just being a baseball player. Coach Kaz: Recruiting at the Academy, we look for the whole person concept and not just an athlete in a sport. The recruit has to have the intellect, character, and honor to be able to handle such a prestigious school. We do so much more than just play baseball. All of our Cadets are on a ½ million dollar full-ride scholarship no matter if they play a sport or not. They will experience Basic Cadet Training, jumping out of airlplanes, flying gliders, and learning how to be an effective leader. We want all of our Cadets to graduate and be leaders of character. The Air Force Academy is a higher calling and we are looking for men and women that want to serve the greatest nation in the world! My mission is to ensure the success in all facets and not just on a baseball field. My job is to ensure that they will all become great men, husbands, and fathers. Our job at the Academy is to produce leaders of character and I will ensure that this happens for these men in all pillars. 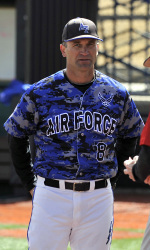 They have not chose just to wear our Air Force baseball uniform, but more importantly our nation’s uniform. That deserves the ultimate respect. I agree with you Coach Kaz. I have the utmost respect for these ball playing Cadets.